Happy National Pizza Day! 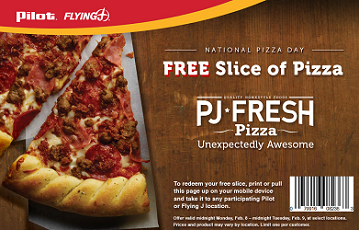 All day today you can score a FREE slice of pizza from Pilot Flying J! The offer is good through midnight tonight (just make sure your local store is participating.) You can check out the coupon when you click on the picture below. Be sure you have it printed or you can show on your mobile device to get your free slice! Offer is good one per customer.